Follow me through the Cambodian countryside via bicycle. Bright green fields stretched to my right and left, scattered with small wooden shacks with resting farm animals, drying clotheslines and barbed wire fences. A bright red dirt path stretched in front of me. The air was hot and extremely humid, a combined feeling of refreshing and stifling. There were no cars and no mopeds, only bikes running over the million little rocks stuck within the country road. Bike riding, especially in smaller, more off-the-beaten-path destinations, like the Cambodian countryside, allows you to go places and see things in ways that traveling in cars, trains or airplanes will never let you do. You can take your time and relax, stop where you want to and go where you want to with little hassle and with little disturbance of the area around you. You get to enjoy the open air and do a little exercising while actually interacting with the people and places that you see. Bike riding may be a little more time consuming than other modes of transportation, but the experiences you have while doing so will almost certainly be more memorable than staring out a window. This is what I discovered when I made proficient use of bicycles in one of Cambodia’s smaller, southern coastal towns. I spent the better part of a day bike riding through dirt paths, past cow herds led by dogs and little children, and along stretching rice fields and salt flats. I ended up having the most memorable experience of my whole trip- Angkor Wat temples, Tuol Sleng and Killing Fields all included. My destination was Kampot, an old French colonial hangout now suffering from the same poverty afflicting most of the rest of the Cambodian countryside. The town is very small, and doesn’t attract near the number of tourists or ex-pats as Phnom Penh and Siem Reap, but it’s all the better for it. Kampot has one of the country’s finest ensembles of old colonial architecture, but I admittedly didn’t spend much time in the city center. 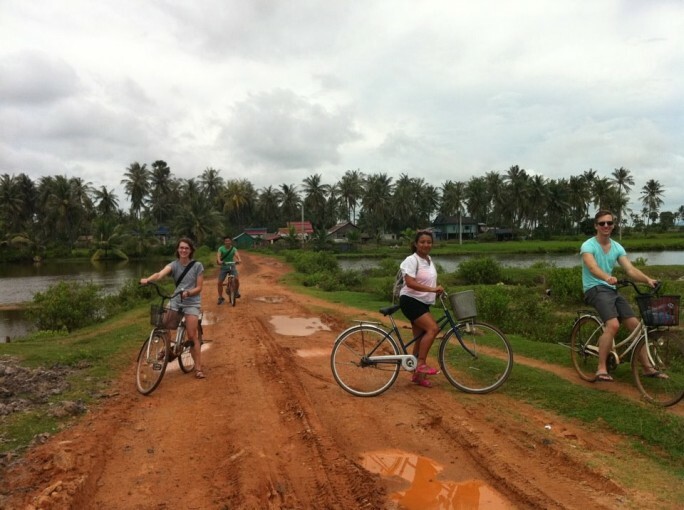 Instead my traveling companions and I took our rental bikes (another plus in Cambodia: bikes cost about $2 to rent for the whole day) and headed on a path leading to the countryside. We went to the farming fields and shacks of poor farmers who have undoubtedly seen very few Westerners in their day. There was no destination and no itinerary, nothing and nobody rushing us through the journey. We kept to the path as the fields flanked around us, stopping only for an occasional photograph. 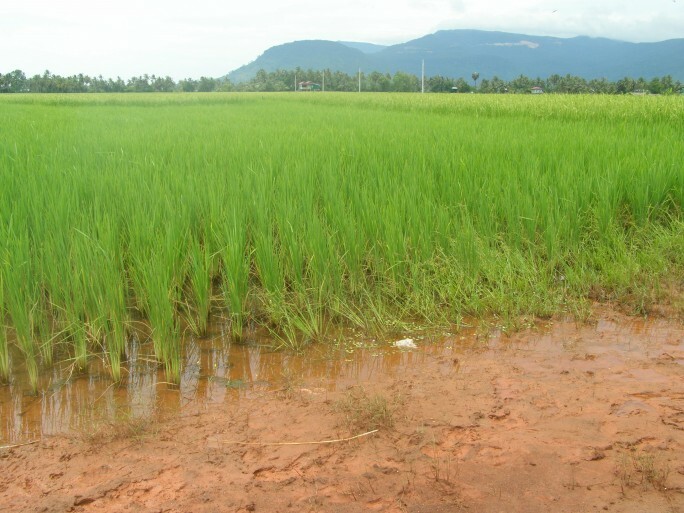 Most of the scenery was the homes of local farmers, the dirt road and rice fields: an accurate depiction of how so many Cambodians live their daily lives. Gone were the pothole-filled roads left un-maintained by corrupt government officials, the hoards of mopeds and vehicles cruising down the main roads, and gone was even the slightest hint of visiting tourists to the region. One thing that remained, however, and which we experienced very often in Cambodia, was a personal and genuine friendliness from the families and children we passed by. Excited children constantly greeted us with shouts of “hellloooo!” both up-close and from afar, and their parents often smiled and waved to us as well. They welcomed us to their land openly and without reservation, furthering the sense of belonging I was already beginning to feel. All these elements together created a scene that was calm and a beauty that was sprawling. Even through the heat, the humidity, and the physical exertion, it was all a profoundly calming experience; being alone and isolated from the city crowds and pollution exhaust, being able to breathe and take in the vivid, stretching colors with little interruption. Those images, feelings and interactions all combined to give you a complete sense of being grounded and connected there, to the land and the people and the history of the whole place. Seeing the locals and their homes and a small piece of their lives, so far removed from my own, created both a feeling of isolation and a sense of belonging I’ve never felt before, but now believe every traveler should experience. My path took me a total of about 10 miles and left me sore, bruised, tired and dirty. Yet if given the chance to do it over again, I would take it in a minute. The next time you ponder renting a car or buying a bus ticket, be a little more adventurous and head to the bike rentals of the Cambodian countryside instead. Don’t be lazy. The experience outweighs the extra effort tenfold. Very much enjoyed this post! The pictures, writing and future exercise riding a bike, combine for a delightful memory! I have a friend who loves to be a bicycle tourist. Now I understand now why she enjoys it so much. I’ll be sharing your post with her. Sometimes no agenda is the best agenda of all!!!!! Well written! I fully agree – a bike is the best way to see the world! 🙂 It’s far more exciting than a car or bus! I loved travelling to Cambodia from Vietnam via the Mekong. I love the Cambodian people and would love to go back some day. Thanks for the post. Cheers! Awesome story and very cool account of your trip. I miss taking time like this to disconnect from our busy lives and appreciate the moment now, thanks for the reminder. Thanks for this lovely entry and pictures. I usually walk everywhere, which brings you even closer to people as they are passing you in the street, hiking trail, fields or forests. I adored Cambodia and feel that the Angkor complex is a must-see destination. I loved Siem Riep too, and yes, the Cambodian people are lovely. Another great experience is a boat ride on the Tonle Sap. I’m glad you got a chance to visit my homeland! I had the same appreciation for the small towns and villages which lay off-the-beaten path. 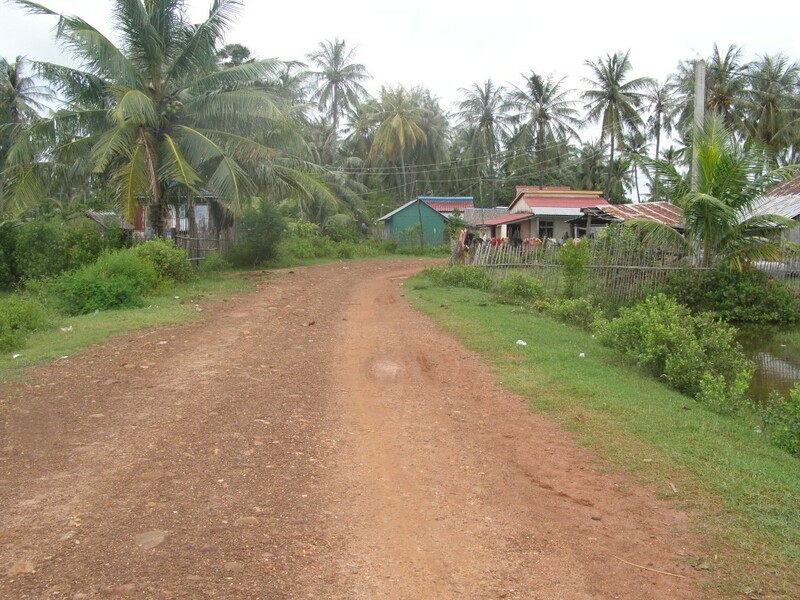 As a matter of fact, many of my relatives who still reside in Cambodia live in/around small dusty roads. I plan on visiting them again in the near future, next time by bike or some other means where I can enjoy the natural beauty of Cambodia! Thanks for the story! I also like to bicycle around or just mosey around when I am in a new place.It is alright in thickly populated Asian countries, if they are not troubled by internal strife. On the other hand it may become scary sometimes especially, in countries like the States, where if you are lost in a strange place and find to your dismay that your cell phone discharged ,you may not find any one to turn to . Vivid and evocative. Takes me back to my own travels in Cambodia in 2007, although cycling would appear to be more pleasant than riding along a dirt track in a 1950s school bus for 9 hours! This is amazing! I would really like to try this someday. I spent most of my time in China on a bike (or on sleeper trains) and it was definitely a worthwhile experience! Kicking myself for not having taken the train from Kunming across the border to Laos/Cambodia/Vietnam while I had the visa…. I am so glad that I stumbled upon these pictures and your account. My husband is from Laos, and the pictures show what I often envision of his father’s side of the family’s experiences of life. My husband has not been back to Laos since leaving over 30 years ago…we would love to go explore someday with our children…until then, I am thankful for connections like these (even if they are from a neighboring country) to bridge the gap in my mind between what I picture and what exists. Thank you for sharing! Wow, Cambodia’s beauty never ceases to amaze me. I can’t wait to travel there with my family to the beautiful landscape, and meet my relatives as well. Thanks for the amazing pictures and words! This is a beautiful display a great time in Cambodia! I love how there was no itinerary, just a journey.